SIC Maui started by Mark Raaphorst back in 2006 when he started building the SIC design from his shop “Ding King” located in on the island of Maui in Hawaii. Since then, Mark has put SIC Maui on the map with some of top race board shapes in the world. 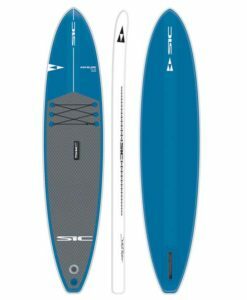 The multi time award winning SIC Bullet has won more channel crossing races in Hawaii such as the M2M and M2O than any other Stand Up Paddleboard to date. While the Bullet Series is the perfect downwinding and fitness board, the X Series Paddleboards have proven to to be some of the top podium finishers in flat-water racing. The newest race board design, the FX Series boards is that one board that you will be stoked on in any condition. Riverbound Sports carries a large selection of SIC Maui Paddleboards. If you don’t see what you’re looking for, be sure to give us a call at the shop (480) 463-6686. We have new boards and gear arriving all season and able to ship right to your door. Riverbound Sports provides the highest level of customer service and quality gear. Riverbound Sports is proud to be an SIC Maui 5 Star Glide Center.